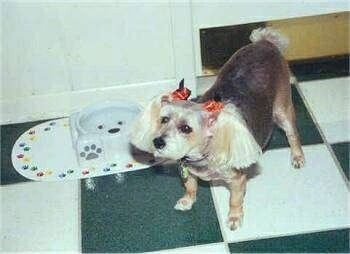 Brandy the Snorkie at 8 months old—her mother was a Mini Schnauzer and father a Yorkshire Terrier. The Snorkie is not a purebred dog. It is a cross between the Miniature Schnauzer and the Yorkshire Terrier. The best way to determine the temperament of a mixed breed is to look up all breeds in the cross and know you can get any combination of any of the characteristics found in either breed. Not all of these designer hybrid dogs being bred are 50% purebred to 50% purebred. It is very common for breeders to breed multi-generation crosses. Reesie the Snorkie at 3 months, weighing 3 lbs.—"When Reesie Cup was younger she was black and tan, however she is now starting to get some grey around her face. 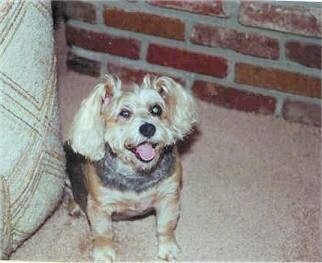 Her mom was a salt-and-pepper Mini Schnauzer and her dad was a Yorkie! Her fur is the soft coat of a Yorkie, and is where her black-and-tan coloring comes from, but her hair is somewhat curly and has the markings of the Mini Schnauzer. Her stance is purely Schnauzer, yet she has the small stature of a Yorkie." Tucker the F1b Snorkie puppy at 8 weeks old—"I took this picture 2 days after we brought this guy home. He is a joy. His father was a Snorkie and his mother was a Mini Schnauzer. This was the first Snorkie I had ever come across and he melted my heart immediately!" Teddy Bear the Snorkie at 12 weeks old, weighing 1.12 pounds—his mother was a white Schnauzer and his father was a Yorkie. 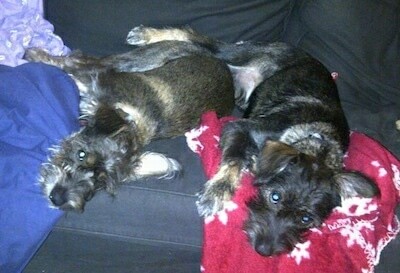 Bailey and Brandy the Snorkies at 8 months old—their mother was a Mini Schnauzer and father a Yorkie. Bailey the Snorkie at 8 months old—his mother was a Mini Schnauzer and father a Yorkie. "I got Sophie and Topher from Alaqua Animal Non-kill Shelter in Freeport, FL. I adopted Sophie when she was about 3 months old and then adopted the last of her littermates at Alaqua, Topher, when he was around 7 months. They are very, very smart! They don't eat with food in their dogbowls until I give the command and pick up things very quickly. Everyone that comes over immediately falls in love with them. I do recommend a fenced-in backyard as they have LOTS of energy!" 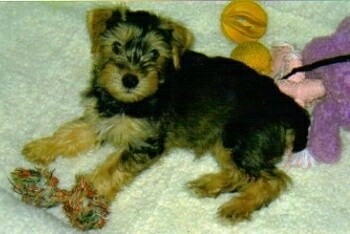 This pretty little girl is a Yorkshire Terrier / Miniature Schnauzer mix (Snorkie). Huey the Snorkie (Yorkie / Mini Schnauzer) puppy at 6 months old—"He is a very intelligent dog and has lots of energy."